Shakespeare said it best. The world we live in is merely a stage and we are the performers. At Kick Dance Studios, we understand this better than anyone, which is why we pride ourselves in making our dancers triple threats. Because the performer who can sing, dance and act can’t be stopped. 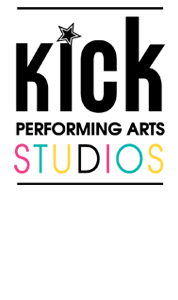 Kick Dance Studios offers a variety of acting, vocal and musical theater and performance-based classes. These classes are for all ages and are provided in a supportive, non-competitive atmosphere where young dancers can bloom. Katie Kurkemelis, one of our musical theater and vocal teachers, is the perfect fit for this genre of performing. She grew up in the performing arts world where her mother introduced her to musical theater at a young age. Katie fell in love with teaching and choreography, and found she had a knack for both. She headed down the teaching path and never looked back. Studio owner Vanessa Berry and musical theater instructor, is proud of the work Kick’s dancers are doing with acting, vocal and dance training. She and the instructors work hard to develop well-rounded dancers with a variety of dance training. That connection with the audience is what keeps Katie, known to her students as Miss Katie, in the performing world when she isn’t teaching. She still performs locally, last appearing in Rent with the Axelrod Performing Arts Center. What better teacher for Kick’s young dancers than someone who is continually learning the latest techniques and using those skills in the real world? “Miss Katie really knows how to connect with kids of all ages and brings out the best in them,” said Vanessa. The training in musical theater Kick Dance provides dancers includes vocal training, acting, and preparing for performances. Classes begin September 21 and half year options continue through December while full classes continue through May. “Musical theater is one of the greatest outlets for a dancer to release energy,” said Katie. “Not only does the dancer need to show technical ability, they must capture different characters through the art of dancing, singing and acting. Musical theater performing isn’t just about the technical ability of the dancer, it’s also about having fun and transporting yourself and your audience to a different world. This triple threat performer is exactly what Kick Dance is preparing its dancers to become. Kick Dance Musical Theater Vocal Training is for ages 7-11 and 10-14. Children begin their training with vocal warm-ups and vocal techniques, and learn upbeat, pop-style Broadway style as well as more classical pieces. Other classes available include Improvisational Acting, Musical Theater Performance, Musical Theater Dance, Musical Theater Vocal Performance Competition Team, and a Triple Threat class. Our musical theater dancers have won big at various competitions, including numerous first place wins and national wins. Call our studio at 732-383-5301 for more information or register online. Photo: Meredith Sheftel, 12, and Blaire Sheftel, 10, both of Rumson, perform during a musical theater production. Kick Dance Studios prepares dancers for acting, dancing, and vocalizing with musical theater performance classes taught by qualified, passionate instructors.